Total Knee Replacement or Total Knee Arthroplasty (TKR/TKA) is the most successful treatment option in the last stage of arthritis. 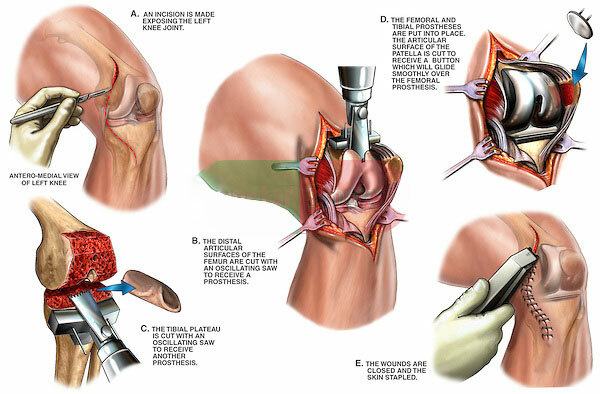 This is a surgical procedure in which small portion of bone and cartilage that is damaged in the arthritic process is removed from the lower end of thigh bone (femur) and upper end of shin bone (tibia) and often from kneecap (patella) and that is replaced by the artifitial joint. The components of new joint , made of metal alloy and high grade polyethylene are fixed with bone cement. The main indication for surgery is pain. When pain in knee arthritis is so sever that it is not controlled by nonsurgical methods and it is hampering simple day to day activities like walking, climbing stairs. When patients need painkillers very often. Taking painkillers are not advisable in any chronic pain like knee arthritis as it damages kidney and gastric wall. Stiffness and deformity are other indication for surgery. Once it has been decided that surgery is the only solution preparation for total knee replacement will start and on first day patient need to spend a long time with the team of doctors, physiotherapist , dietitian. We take time to know details of your medical history. Thorough examination of knee joint along with spine, hip and other joints are done. Details of Skin , Dental and urinary system condition is very important and if require prior treatment may be necessary. Through Blood test, cardio pulmonary testing , urine analysis is done. You may have to discontinue or alter some of your home mediations if needed. Quit smoking at least 2 weeks before surgery. You need to start some exercises before operation. Aneasthetist ,Surgeon, Physiotherapist ,Dietetian will visit you. You can discuss about the type of anaesthesia with the Anaesthetist. Generally surgery is done by spinal anaesthesia that is by a small injection at your back the lower part of body is paralysed for 3-4 hours. Operative area will be washed and drapped with antibiotic solution at the night before surgery. For pain control we use cocktail local infiltration , oral and injectable pain killers. Initially patient is allowed to take liquid like soup or tea. Gradually patient is shifted to normal diet after 3-4 hours of surgery. On 2nd day we take a xray and blood test. Patient can sit on bed with legs dangling. Physiotherapy is started. On 3rd day patient is made to stand and walk with support. Patient can go to toilet. Patient goes home on 4th or 5th day. An attendant is a must for the first few weeks. Patient needs assistance with dressing ,getting meals and to go to toilet with walker. Physiotherapist visits at home and helps doing all the exercises and gait training once a day. However, patient needs to repeat all those exercises several times a day. Operative area should be kept dry till staples are removed which is done at 2 weeks. After that patient can take full shower. Climbing stairs can be started 2-3 weeks of the surgery depending on progress. One can return to work 4-8 weeks of operation depending of preoperative fitness. Two major complications of TKR are Blood clots at legs and lungs and Infection. We take all necessary prophylactic measures to prevent such complications and such complication rate is less than 1% in standard set up. There is significant pain relief after surgery in all patients undergoing successful knee replacement and that effect sustain for 20-25 years. Patients are no longer dependent on painkillers and they can resume their normal activities of daily living and can participate in sports like golf, swimming. Walking. In most of the cases of stiff knee range of motion increases after surgery. Donot overload. Running , jumping is absolutely not allowed even if one can. Repeated sitting on floor or squat even if patient have full range of motion in knee joint. Total cost of surgery in Kolkata, like other states in India, depends on the type of implants and in which setup surgery will be performed. Total cost for surgery inclusive of all starts from Rs 1 lac (terms and conditions applied).